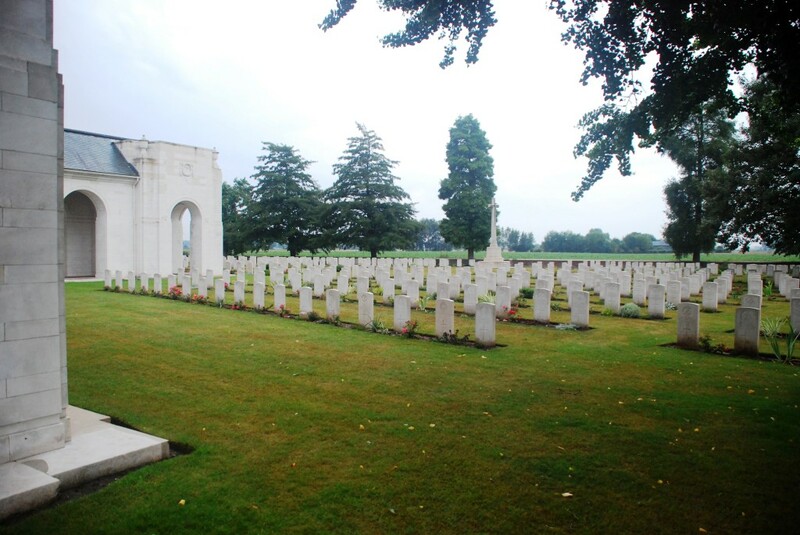 Tearle Family history in Dunstable, Bedfordshire. 27 Jan 1834 ADA dau of James Tearle, Horsekeeper. 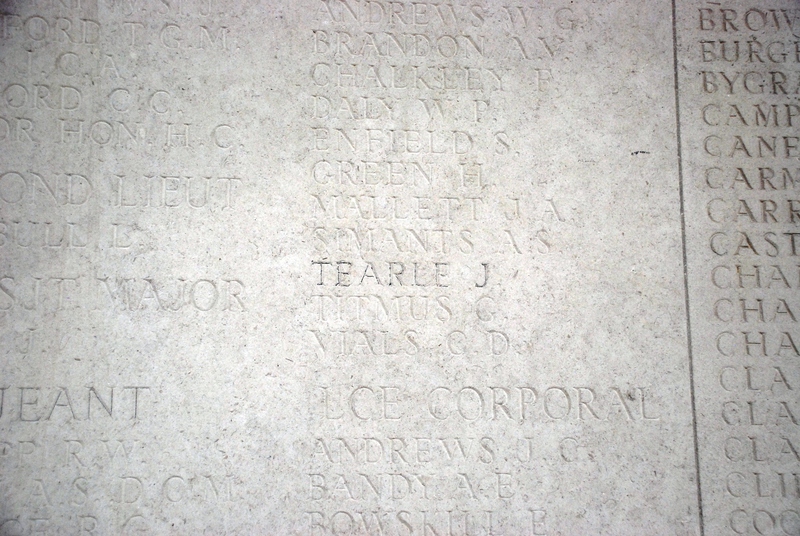 Son of Richard Webb Tearle and Kezia nee Wright. Gson of James 1806, married Mary Ann Hallifax. Son of Charles 1840 & Sarah nee Hill. Married mary Ann Bullock. Joseph 1737. Dau of Charles 1836 & Annie nee Eastment. Married George Spivey. Joseph 1737. Son of Charles Bowler T 1848 & Constance nee Dickens. Married Maggie Clara Weller. Joseph 1737. Son of Charles Bowler T 1848 & Constance nee Dickens. Married Beatrice Putman. Joseph 1737. Son of James Henry T 1884 & Edith Lydia nee Morgan. Sergeant in the Australian Army in WW2. Married Patricia Bridget Cotter. John 1741. Ivy 1906, dau of Albert Edward 1879 & Norah Kate nee Cardell nee Pecks. Gdau Charles Bowler T.
Winifred 1908, dau of Albert Edward 1879 & Norah Kate nee Cardell nee Pecks. Joseph 1737. Dau of Louisa Sylvia Tearle 1890, gdau Charles 1863 and Louisa Caroline nee Green. Joseph 1737. Ethel Grace dau of Alfred 1887 and Annie nee Rathbone. Bap at 18yrs. Married Stanley Capp. 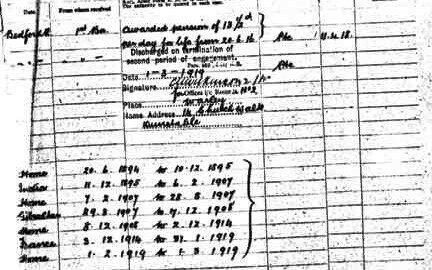 ?Dec 1934 ?ELIZABETH TEARLE dau of Arthur and Elizabeth Tearle of 10 Chiltern Road Dunstable Lab born 17 ? 1916 ? records may reveal more if needed. UNK. If this was his first marriage, the latest William could be born would be 1694. The nearest to this is William 1699, son of Thomas and Sarah nee Pepyatt, so this is not him. The only likely candidate on the Tree is William 1671 Stbg son of John 1645 and Jane on the John 1560 Tree (Nathaniel’s Tree). Unfortunately for us he married an Elizabeth and they had children from 1707 to 1722, so it isn’t him. A likely person may be William 1670 of Stanbridge, whose parents were John 1645 and Jane nee Purrett. William was the grandson of John 1620 and he married Susannah; they had a Mary Tearle in 1697 and another Mary in 1700. If Susannah died, it could well be this William who married Ann Ford. 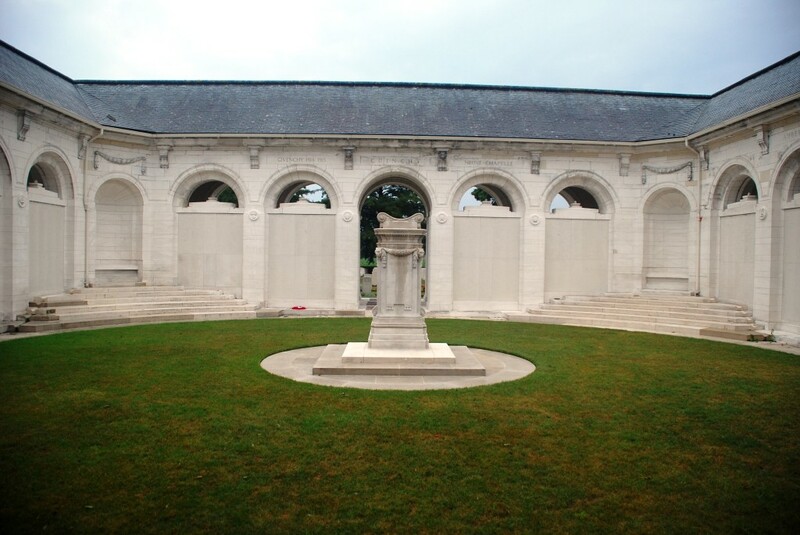 Richard Webb T 1826, stonemason, son James 1806 and Mary Ann nee Webb. Kezia died young, and their son George Nash T lived with Richard’s parents. G-gson of Joseph 1737. Charles 1836 son George 1809 and Elizabeth 1810. George is descended from Joseph 1737 and Elizabeth from John 1741. Charles is the g-gson of them both. One of their daughters, Charlotte Louisa, emigrated to NZ and died in Auckland 1947. Witnesses Thomas John Smith and Clara Cleaver Charles Bowler T 1848, brother of Richard Webb T above, son of James 1806 and Mary Ann nee Webb. Bowler is named after Mary Ann’s mother. Joseph 1737. Charles 1840, son William 1814 and Hannah nee Pratt. G-gson Joseph 1737. Emily 1852, sister of Charles Bowler T and Richard Webb T above. Levi 1855 of Thorn, son William 1814 and Hannah nee Pratt. Joseph 1737. Albert Edward 1879 Dunst, son Charles Bowler T and Constance Cleaver nee Dickens. Joseph 1737. Priscilla 1886 Dunst, dau George 1851 and Louisa nee Finch. Went to see brother James Henry T when he was living in NZ for a while. Edith Lydia is her sister-in-law. John 1741. Medal in WW1 for rescuing men while under fire. Joseph 1737. Witnesses John Henry Tearle and Lily Northwood. brother and soon-to-be sister-in-law. William 1749. John Henry T 1885, son George 1861 and Sarah Jane nee Horn. G-gson Jabez 1792. William 1749. Florence Emily T 1881, dau Charles 1836 and Annie nee Eastment. Joseph 1737. Amelia 1892, dau George 1861 and Sarah Jane nee Horn. Witnesses are her youngest brother and her soon-to-be sister-in-law. Died at only 37yrs. G-gdau Jabez 1792. William 1794. Donald Ralph T 1904, son Richard Ralph T 1870 and Lillian Rosa nee Lofts. G-son Nathaniel 1839. Leonard Leslie is Donald’s eldest brother. John 1560. Hannah 1844, dau of James 1806 and Mary Ann nee Webb. Joseph 1737. James 1806, son Richard 1778 and Mary nee Pestel. Joseph 1737. Dau of Charles 1836 and Annie nee Eastment. Joseph 1737. Mary Ann nee Webb wife of James 1806. Joseph 1737.
many years. 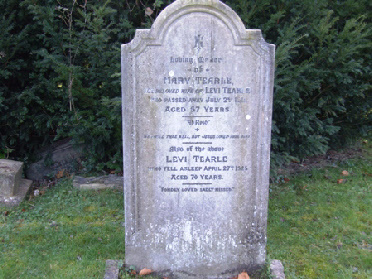 One of the few Tearle headstones in Dunstable cemetery. Thomas 1737 via Fanny 1780. Dau of Ann 1851, gdau of William 1814 & Hannah nee Pratt. Joseph 1737. Charles 1836, husb Annie nee Eastment, son of George 1809 and Elizabeth Tearle. Joseph 1737. Ann 1858, dau of Charles 1831 and Sarah Ann nee Brandon. “Deaf and dumb from birth.” John 1741. Charles 1840, husb Sarah nee Hill, son of William 1814 and Hannah nee Pratt. Joseph 1737. Hannah nee Pratt, wife of William 1814. Joseph 1737. Elizabeth Tearle 1810, dau John 1770 and Mary nee Janes and wife of George 1809. John 1741. Richard Webb Tearle 1826, son James 1806 and Mary Ann nee Webb. Joseph 1737. 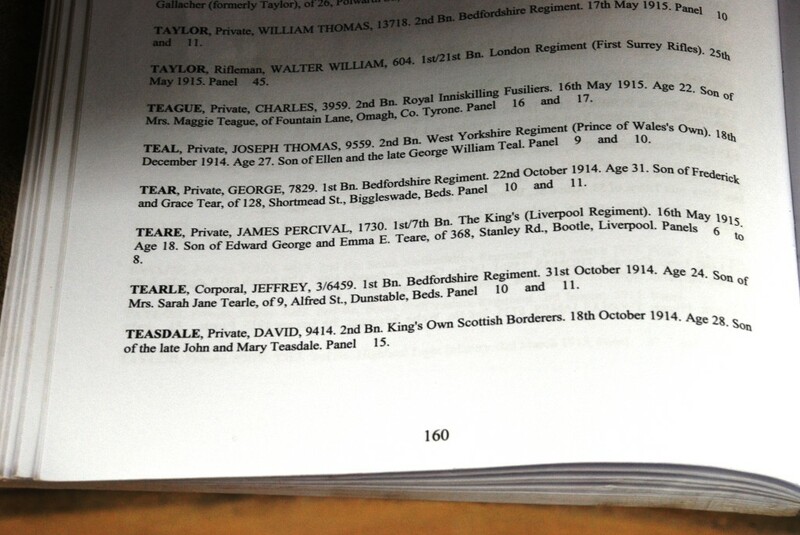 William 1814 son of Richard & Mary nee Pestell. Joseph 1737. Ruth Allen ne Willis, wife of James 1847. Joseph 1737. Charles 1831, son of Thos 1800 and Mary nee Cook, husb Sarah Ann nee Brandon. John 1741. Reginald born and died EB 1899. 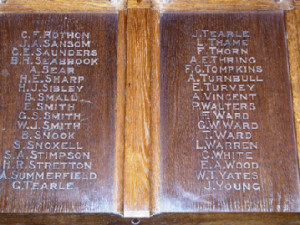 Arthur married Elizabeth Saunders in 1905. John 1741. Dau of William Charles 1869 and Jennie Anstee, gdau Charles Bowler T. Joseph 1737. Albert Edward 1879, son of Charles Bowler T and Constance Cleaver nee Dickens. Joseph 1737. 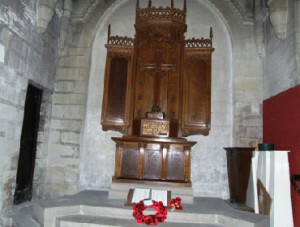 Dau of John Henry 1885 and Lily nee Northwood. William 1749. Ernest 1870, son of Charles Bowler T and Constance Cleaver nee Dickens. Joseph 1737. Norah Kate nee Cardell wife of Albert Edward 1879, son of Charles Bowler T. Joseph 1737. Francis 1872, son of Charles Bowler T and Constance Cleaver nee Dickens. Joseph 1737. Hetty Florence nee Bourn, wife Robert 1887, gson William 1830 and Ann nee Rogers. John 1741.
and Constance Cleaver nee Dickens. Joseph 1737. Constance Cleaver nee Dickens the wife of Charles Bowler Tearle. Joseph 1737. Millicent 1911, dau of Arthur Tearle 1877 and Elizabeth nee Saunders. Arthur’s mother was Tabitha. Sarah Jane nee Horn wife of George 1861, son of George 1831 and Hannah Maria nee Janes. Sarah Jane nee Horn. William 1749. George 1794 and Mary nee Hill. John 1741. 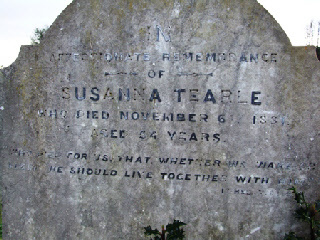 This is the memorial to Susanna, born 28 May 1827, in Dagnall, Bucks, not far from Edlesborough. Her parents were Abel 1797 Edlesborough and Hannah nee Frost. 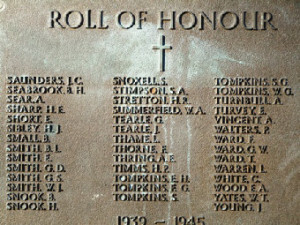 Abel was the son of the famous Fanny Tearle who is the ancestor of several families in Australia. Fanny is very likely to be the daughter of Thomas 1737 Stanbridge and Susannah nee Attwell. Thus Susanna, then, is of the branch Thomas 1737. 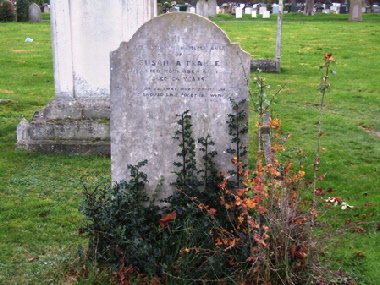 Susanna Tearle, 1827 Dagnall, headstone in Dunstable Cemetery. I do wonder who erected this beautiful memorial to her. If you thought Chalgrave was small, then Thorn, where Levi was born, is little more than a scattering of farm buildings. As you leave Dunstable on the A5 going north down Chalk Hill, you will see the A505 left to Stanbridge. A couple of hundred metres along to the right is Thorn Rd. Thorn is a couple of kilometres on your left. 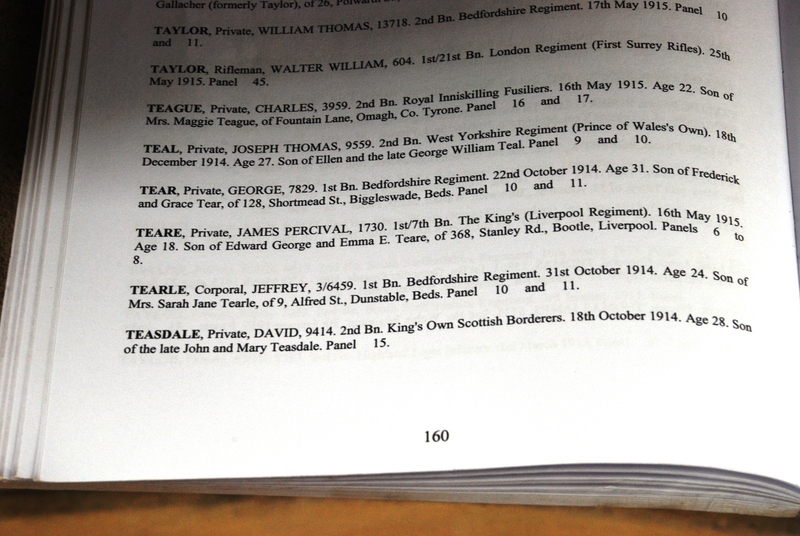 Levi’s parents are William 1815 of Chalgrave/Tebworth and Hannah nee Pratt. 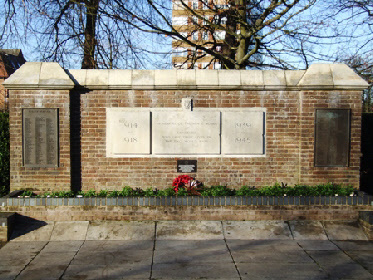 William’s parents were Richard 1778 of Stanbridge and Mary nee Pestel, and Richard’s parents were Joseph 1737 of Stanbridge and Phoebe nee Capp. Thus Levi is of the branch Joseph 1737. You can follow his progress through the 19th Century censuses below. He married Mary Summerfield of Dunstable in 1874. This handsome headstone in Dunstable General Cemetery is to Mary nee Summerfield and Levi 1855. 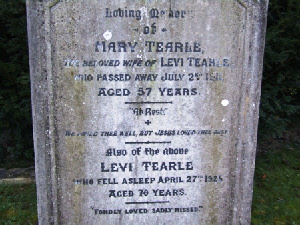 The young couple were both involved in the straw hat industry – Levi as a plait dyer, and Mary as a hat sewer. Levi and family have moved to 13 Melson St, Luton. Levi calls himself a Plait Dyer and Bleacher and he seems to be earning enough such that Mary does not have to work. As you know, Luton was the centre of the straw hat industry, and even to this day, Luton Town football team is called The Hatters and Luton still has an active and world-renowned hat industry. This is the last view we have of Levi and his family. He is at the same address and still a Plait Dyer. He died 19 April, 1925.